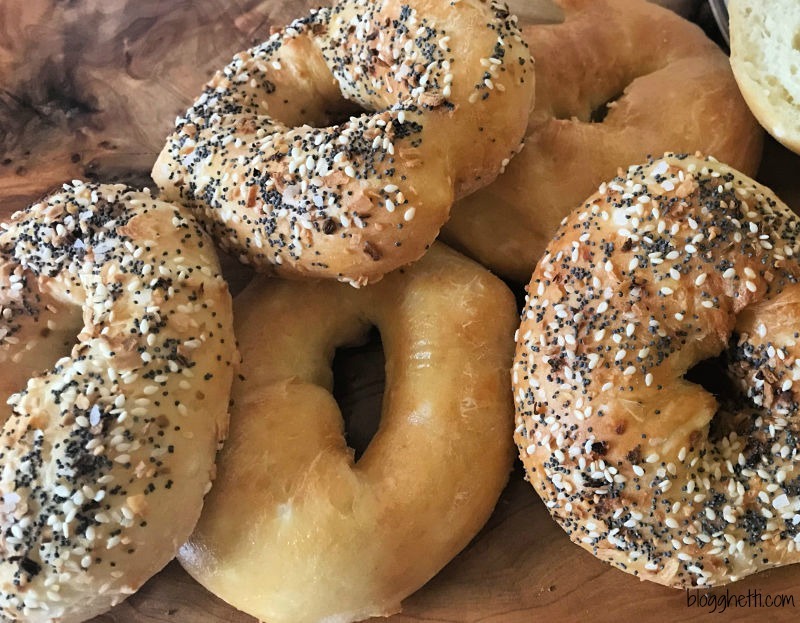 Homemade bagels are easy to make using only a few ingredients, and an air fryer. Perfect for breakfasts and sandwiches, plus the bagels can be frozen for later. If you ever thought about making your own bagels but stopped when you read the recipe directions and how detailed they were. There’s rising of the dough, and boiling the dough, then baking them. It’s all an day thing. Don’t get me wrong, I love baking bread and will do so all day long. If I am in the mood for a bagel, I sort of want it then and not later. It’s easier to go buy one from the store. This recipe is going to blow your mind! Seriously, when I first saw the recipe, I was totally jumping up and down with joy. 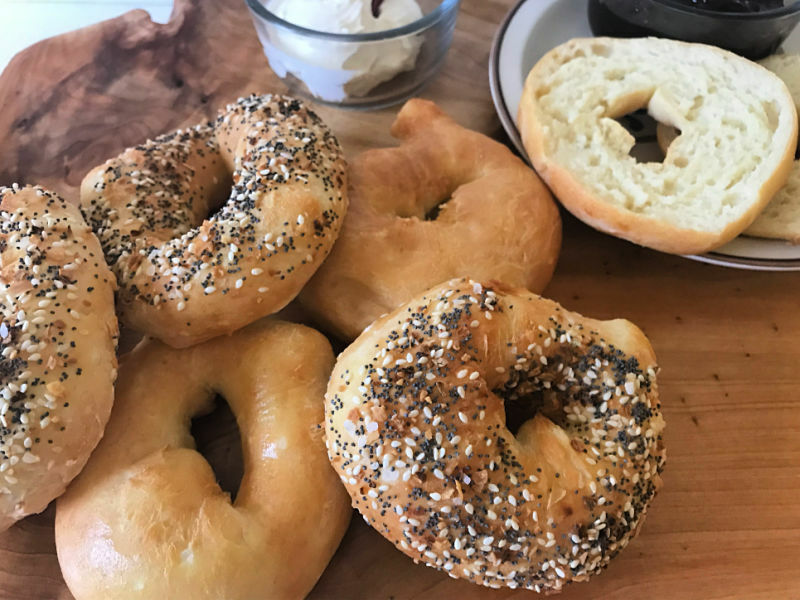 Not only can you make these bagels in 15 minutes using an air fryer, but you can also make them in the oven in about 30 minutes. I’m all for that 15 minute bagel, my friends. 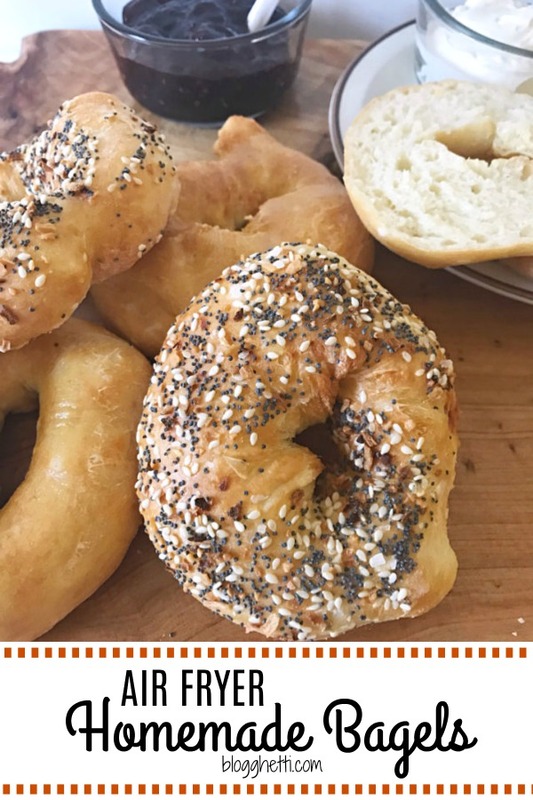 Plus, making them at home, you can season (or not) the bagels however you wish. Everything seasoning, poppy seeds, sesame seeds, cinnamon & raisins, and on and on. Simple ingredients are in these too. Flour, baking powder, Greek non-fat yogurt, and a tiny bit of salt. Egg wash the tops of the bagels if you want, season and bake. Simple. You’ll just be amazed at how light, tender, and delicious they are. Secret: I’ve made them three times in two days. There were zero left after two days. Another secret: This Hamilton Beach Air Fryer is amazing, and makes great bagels, wings, fries, and so so much more. I can’t stop using it. Some of the items below contain affiliate links; I am a participant in the Amazon Services LLC Associates Program, an affiliate advertising program designed to provide a means for us to earn fees by linking to Amazon.com and affiliated sites. However, I only promote things that I love and think you will love, too. You can read about my privacy policies here. Let’s talk about Air Fryers, shall we? The Hamilton Beach Air Fryer would make a great gift for anyone that loves to cook and entertain! Achieve a crispy fried texture when cooking a variety of foods, from French fries to steak. The electric air fryer is quick and easy to use with no preheating necessary. Select either a pre-programmed setting or a time and temperature up to 400 degrees. One touch is all it takes to cook French fries, chicken, seafood, steak, baked goods and veggies. Nonstick food basket is removable to easily hand wash.
Large air fryer cooking basket holds 2.5 liters. You can learn more about this product or any Hamilton Beach product by following them on Twitter, Instagram, and Facebook. Add the yogurt, mix well with fork until it looks like small crumbs. Divide dough into four equal pieces, roll each piece into a ¾ inch thick rope. Join ends. Brush with egg wash, and top with seasonings, if desired. Place in air fryer, be sure not to crowd them, so bake in batches. Remove from air fryer and let cool about 15 minutes before slicing. The bagels will still be a little warm. To store: place in a plastic bag and store in refrigerator for up to 3 days. To freeze, slice cooled bagels in half and wrap individually in plastic wrap and then in freezer safe container. To eat: thaw and pop into toaster. To bake in oven: Preheat oven to 400 degrees. Line a baking sheet with a slipmat or parchment paper. (spray parchment with non-stick spray). Bake for 25-30 minutes. Let cool 15 minutes. I would try out these bagels! They look so good! What a great recipe. I recently bought an air fryer and although the few things I prepared in it were delicious, I was thinking it really didn’t do much. How wrong was I? Guess I need to research some other recipes. TFS. Tater tots would be the first thing I would cook in it. I would also like to try chicken nuggets and other finger foods. I think this recipe would be the first thing I would try! I would make french fries first, then coconut lime shrimp. I would love to use an air fryer, I think it is not only versatile, but healthier than conventional frying. OH yum. As a southern we love fried. Seafood, fish, shrimp and or chicken first. I would diffinitly make the bagels, yum! I would have to try french fries first.